I never had nasal allergies until a year ago. Then, in mid-summer when everyone else's allergy symptoms were easing up, a neighbor of mine and I started having symptoms. Neither of us had ever had seasonal allergies before so it took a while to realize that was what we had. Fortunately, our symptoms were fairly mild and we were able to get relief with typical over-the-counter meds. This year, I expected to have some problems in spring, but I was fine through all the tree and grass pollen outpourings. Then again, about a week ago, I started having symptoms. Levels of tree, grass and weed pollens are low right now and friends of mine who suffer with them are feeling much better than they did a couple of months ago. So I wondered what it is that I am sensitive to. Yesterday I might have figured it out. I have a section of privet hedge (Ligustrum japonicum) along one side of my yard, which has just come into full bloom. The past two springs have been particularly rainy and the hedge has responded by producing record crops of big, creamy white panicles (flowers) in mid-July. They are pretty and the bees love them, but as far as I am concerned they smell terrible. Since this hedge is close to my windows, which I have open most of the time in summer, and close to my garden, where I like to spend my time, I decided to cut off a bunch of the flowers to reduce the odor. That helped. And after dumping a couple of buckets of blooms into the yard waste bin, I thought my nasal symptoms were eased a bit, too. I wondered then if privet pollen is something people have allergic reactions to. So I did a google search. And sure enough! Privet pollen is known to trigger allergic reactions, asthma, eczema and hay fever. 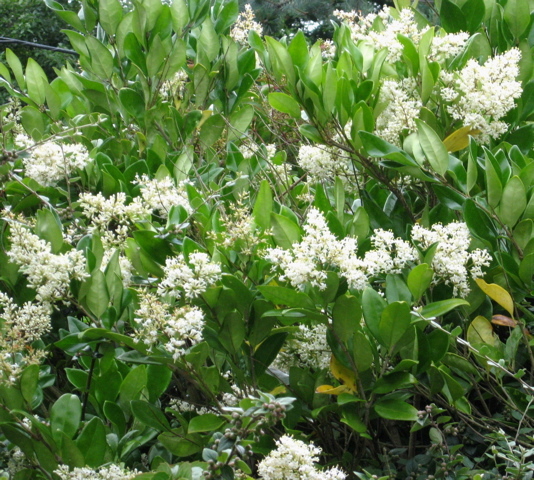 In fact, it is illegal to grow or sell privet plants in New Zealand because of the health problems it causes. I'm not planning to take down the hedge anytime soon, but I will be a lot more diligent from now on about removing those stinky flowers as soon as they appear.